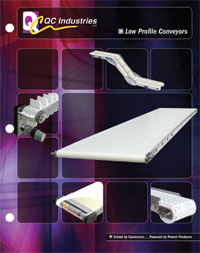 published a Conveyor Selection Guide that serves as an introduction to its line of low-profile conveyors. The brochure details Lube-for-Life bearings, with downloadable 2D and 3D CAD models. Described are 125-series low-profile belt conveyors with stainless-steel, magnetic and corrosion-resistant options; 125Z-series angled-frame conveyors; InnerDrive conveyors that save space by placing the motor inside the drive pulley; Flextrac plastic chain-belt conveyors; 300-series indexing conveyors, accurate to within ±0.015 in., 250-series center-and end-drive conveyors, for heavy loads; and 400-series conveyors available in wider and longer models than standard low-profile conveyors.